Want to know why air travel is still, by far, the safest way to go? Do you want to know how hospitals around the world can cut the risk of post-surgical complications and death by more than half? Do you wonder why the greatest triumphs of engineering, buildings and infrastructure, are beautiful, as well as safe and functional? The answer is checklists. 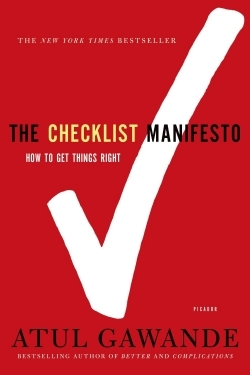 I was inspired by this simple and powerful tool after reading The Checklist Manifesto, by Atul Gawande, a surgical specialist. A checklist is a simple list that guides surgeons, builders, editors, and others through a routine process. It doesn’t try to cover every possible contingency, like some flow charts attempt to do. It’s not about removing the expert. It’s about allowing the expert to focus on unusual problems that are characteristic of just about every process, and not to have to think about the things she has done over and over again. A checklist is an antidote to boredom during routine times and panic in an emergency; it also saves lives, treasure, and professional reputations. As things become more complicated, the checklist becomes more important. And checklists allow everyone involved to have a real stake in a project. Gawande uses several startling examples of checklists averting disaster in the operating room. For example, he and several other doctors, engineers, and other experts designed a checklist for surgeons for the World Health Organization. But Gawande didn’t think he needed one—until he did. Gawande was preparing to do surgery to remove a mass next to a major blood vessel in one of his patients. As the nurse went from item to item on the surgery checklist, she asked the surgeon if he needed to set aside extra blood for emergency transfusions—a routine matter. He said no, trusting in his skill at a procedure he had done dozens of times. But the nurse asked the blood bank at the hospital to have some of the patient’s blood type ready just n case. When Gawande nicked the patient’s blood vessel and the patient started to bleed out, the reserve blood saved his life. And notice that the checklist put some authority in the hands of a surgical nurse, and not all of it in the hands of the surgeon. Checklists empower everyone involved to take responsibility for the outcome. Gawande used several other examples, from a high-rise building project in New York City, where everyone from the architect to the welders had a say in solving the problems that inevitably occur in any building project, to a checklist used by airline pilots. As airplanes became more sophisticated, so did the checklists, but they still effectively keep pilots from making serious errors in routine matters, and offer simple steps to take in an emergency. In an emergency the checklist allows the pilots to diagnose the problem and fix it in an orderly way. Here is an example. The front cargo door of a 747 with 337 passengers on board wasn’t secured properly before take off. At a high altitude, the pressurized cargo bay exploded outward, and the sudden depressurization of the whole airplane sucked a flight attendant right out a large hole in the fuselage. Pilots, safety officials, and others put their heads together and added a pre-flight test to their checklist to assure that all cargo bay doors are secured. And when an airplane suddenly looses pressure at high altitudes, as was the case with the 747, a simple checklist has pilots immediately drop to a low altitude to balance the inside and outside pressure, and to allow the passengers to breath without supplemental oxygen. We use a checklist in the production cycle for Home Energy. I don’t have to think about when to send articles to the copyeditor, when to send drafts out for review, and when to send reminders to authors about upcoming drafts. My iCal, after I upload our production calendar, lets me know by sending me an email telling me what I have to do today and tomorrow. This makes my life a lot simpler and keeps me from staying up all night worrying about the magazine we are getting ready for the printer, and the next two on our plate! I’m pretty sure that a checklist is not a new concept to most of you reading this. But I am curious how you have used a checklist in an effective way to save time, money, and to avoid damaging your property, yourself, your family, or your reputation? Will you please share your successes at home and at work, and lessons learned from your failures, with all of us? Isn’t that what social media is all about?